Editor's note: Today we hear from Robert Cheetham, founder and CEO of Philadelphia-based geospatial web software and analysis firm Azavea. 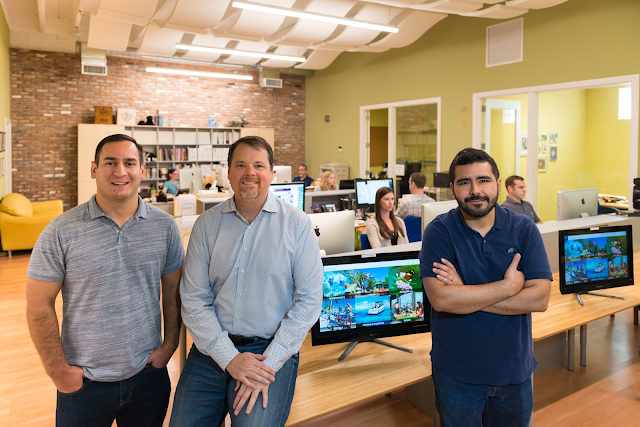 Read about how Azavea has relied on Google for Work tools for more than eight years and recently started using Chromebox for meetings and Chromebooks so employees can work together from anywhere. When I founded Azavea in 2000, I dreamed of creating a great work environment focused on driving social impact by applying geospatial technology. We're a certified B Corporation, and our mission-driven work includes climate change, elections, public safety, transit, water infrastructure and natural resources. Inspired by my first job working for a local government agency in Japan, where cubicles don’t exist, I designed our workspace to have an open layout, long before it became popular in contemporary offices. Today, we rely on Google Apps, Chromebooks and Chromebox for meetings to support this collaborative environment and help us work closely together on our software and data analytics projects. In the early years, when Azavea only had a handful of employees, we installed basic workplace software from a CD-ROM and had limited server space. When we outgrew our email system in 2008, we chose Gmail. Our employees quickly started using Google Calendar, Docs, Hangouts and Sheets because they integrate so closely with Gmail. These tools helped us work effectively together on projects, so it was a natural next step. In 2012, our software developers started asking for supplementary computers to let them work from home, when traveling for client meetings or even in the office kitchen. We looked into tablets, but they were expensive and didn’t have fully functional keyboards. As longtime Google users, our Operations team investigated options from Google. Chromebooks are fast, affordable, secure and remarkably powerful, so we started offering them as supplementary devices for people who wanted more mobility. Our colleagues can easily switch between their main workstations and portable Chromebooks, and the long-lasting battery makes them the perfect companion for frequent travelers, office roamers and remote employees. I typically travel for a week each month myself, so I use my Chromebook on long flights as well as meetings and conferences where there may not be convenient power. It typically lasts more than nine hours, while a laptop only lasts two or three. The company now has more than fifty people, and when we moved to a new office a few months ago, we needed a videoconferencing solution for a dozen new meeting rooms, we once again turned to Google and picked Chromebox for meetings. Like the other Google products we use, Chromebox is affordable, easy to install and integrates with our existing workplace software, like Hangouts and Calendar. Anyone can quickly set up and join a meeting. As a small firm, this ease of use is critical for us — we don’t have a team of dedicated IT staff, so we don’t have capacity to constantly deal with technical difficulties or high-maintenance updates. I wanted to start a company that felt like a community and made an impact. Over the past several years, Google has significantly enhanced our company’s operations because their products simply work and easily scale as the company has grown. Our teams are able to work effectively together, no matter where we are. For any forward-thinking business, embracing the cloud is no longer a question of why but how. How do I get there and how will it improve my bottom line? The answer could be as simple as trust. According to new research conducted by the Economist Intelligence Unit (EIU) and sponsored by Google, companies with high levels of trust in the cloud report a 9% rise in profitability year on year, compared to 1% for their more skeptical peers. The survey of 452 senior executives across 10 countries examined their use of the cloud and their attitudes towards its security, reliability, accessibility and scale. 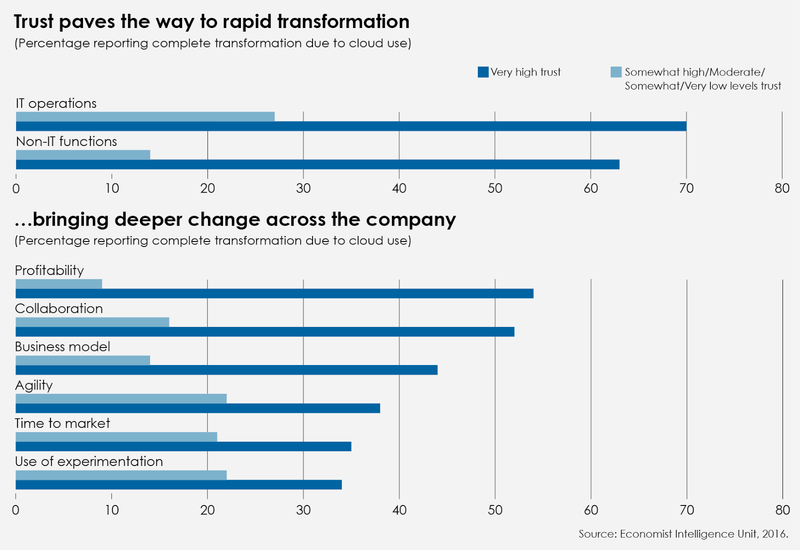 The results show a clear link between an organization’s profitability and their trust in the cloud, suggesting cloud adoption alone is not enough to guarantee a positive business impact. Companies that actively foster trust in cloud technology report more than just a boost to their bottom line — they believe their trust in cloud technology drives workplace transformation. “As organizations expand their use of the cloud, those with higher levels of trust are able to transform their organizations more quickly, and the resulting business benefits can be substantial,” explains EIU Senior Editor Carolyn Whelan. Building trust in any organization is an ongoing process that needs to be championed by a company’s leadership team. By encouraging education and experimentation, leaders can help to change how their teams embrace working in the cloud. The survey results support the idea that leaders shape a culture of trust. Nearly half (47%) of respondents whose senior executives prioritize cloud trust note an increase in trust levels over the last three years, versus 6% whose leaders don’t. Of the respondents whose companies have low levels of trust in the cloud, nearly half (45%) said that general management is the most common impediment to cloud adoption. The greatest benefit of a cloud-enabled world is the potential to fundamentally change the way businesses work, and building trust in the cloud requires everyone, starting with leadership. To learn more about how moving to the cloud can make businesses more secure and successful, read the EIU report and tune in to Atmosphere Digital: Rethinking Security in the Cloud on June 28, 2016 at 10 a.m. PT. Editor's note: Today we hear from Koen Bosmans, Senior Systems Administrator at Melexis, a microelectronics supplier based in Tessenderlo, Belgium. One of the world’s top producers of sensors and microchips for the automotive industry, Melexis is expanding into new industries, with great success. Spread across 11 offices in nine countries, read how this truly global company uses Google Apps for Work to build its international team. There’s a good chance you’ve used one of our products without realising it. The sophisticated microchips we make are in everything from children’s ear thermometers, to airbags, to smartphones, to drones. And as the demand for microelectronics has grown, so has our business: Melexis shares are worth 20 times more now than when I started working here in 1999, and today we employ 1,200 staff worldwide in Belgium, Bulgaria, France, Germany, Switzerland, China, Malaysia, the Ukraine and the US. As early as 2010, we could see that this rapid expansion might lead to “silo thinking” that prevents outstanding engineers in different countries from working together effectively in a global team. That’s why Melexis management asked me to research alternatives to the open-source software we were using. I ranked five IT solutions on 25 criteria — including web accessibility, document sharing and OS compatibility — and Google Apps for Work came out on top. We bought 500 accounts and got ready to deploy them over 13 weeks. But after the first fortnight, I realised that Google Apps training was so straightforward I could ask a student working in my department to do it. He travelled the world for three months and trained the entire company. Google Apps improves staff satisfaction with their work environment and rewards teamwork. In the first quarter after we switched to Gmail, the number of complaints about email dropped by 65%. No more spam or slow webmail, and Calendar has ended confusion over meeting room bookings. Expansion is much easier, too; instead of having to install servers and data lines in every new office, all we need is an internet connection. Plus, we can expand without asking engineers to relocate, since as part of a virtual team, they can talk to colleagues anywhere in the world over Hangouts while working together on a shared document in Sheets. And wherever we are, Drive saves time by letting colleagues work simultaneously on single documents — whether it’s our R&D teams collecting test data in Sheets, or the IT team preparing a presentation on Slides for our monthly meeting. Through my experience using Google Apps within our IT team, I understand how something as simple as face-to-face contact through Hangouts can make a team so much stronger. My IT Service Desk team is made up of eight people split over six locations, and we meet every two days on Hangouts to discuss work. I noticed that seeing each other so often created a relaxed and friendly dynamic that made it easier to share advice and help each other. At Melexis, we don’t just work hard, we play hard, too. Fun is part of our DNA, and three years ago, we invited everyone to take part in an international computer game LAN party. We’ve been doing it every year since, and it’s always a great opportunity to get to know each other across different locations. 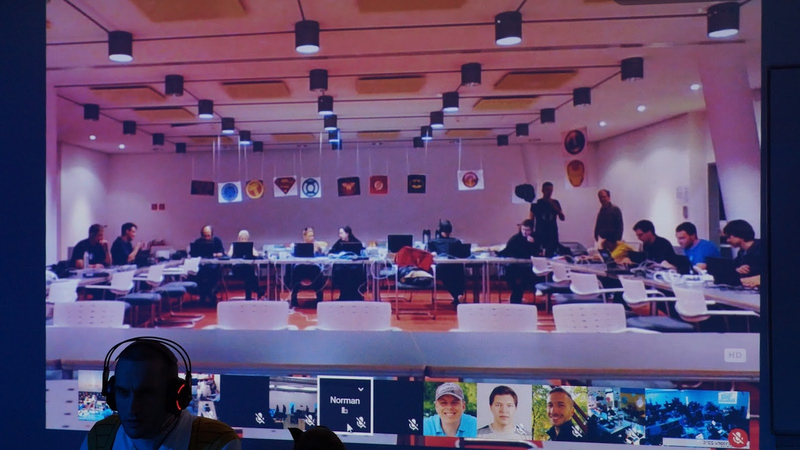 Google Apps makes these international LAN parties possible. Staff use Forms to sign up for some of the four or five games we’ll be playing in competition, and we organise times and equipment through a community on Google+. 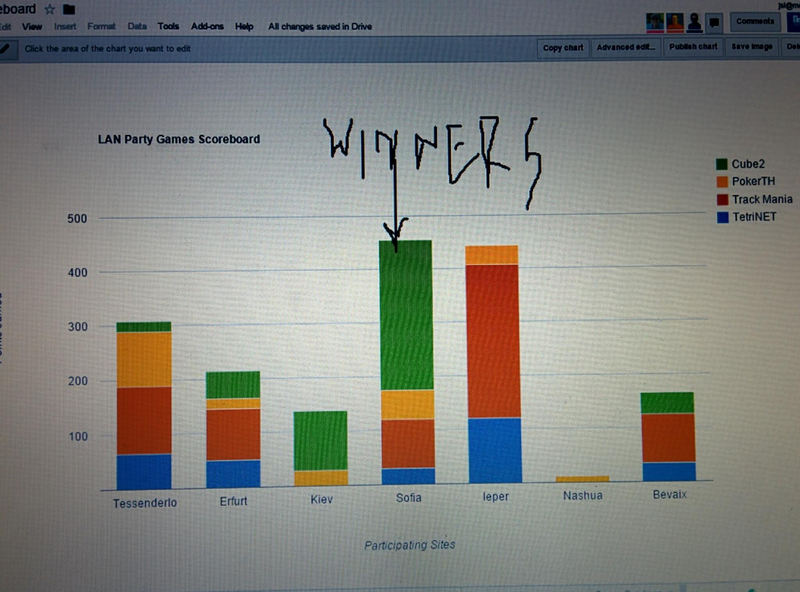 Presentations on Slides explain what we’re doing, and we use Sheets to keep score. The party starts at 6pm on a Friday. 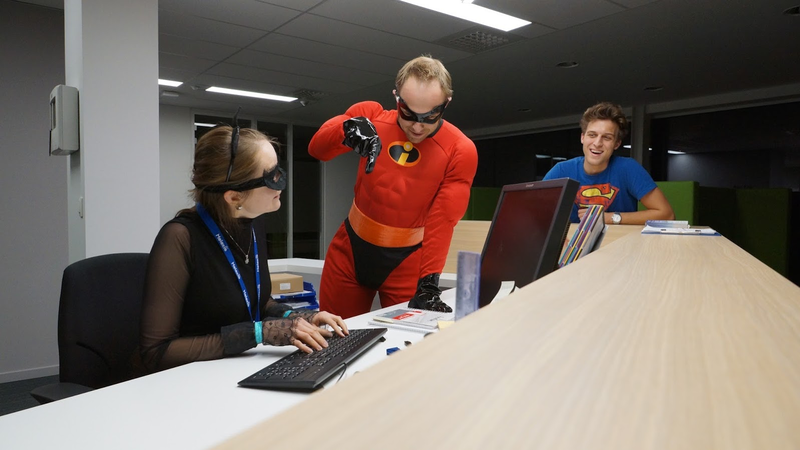 In each office, staff decorate a room, put on fancy dress, and set up a Hangout between all the offices, even our senior leaders get dressed up and take part! Projection screens, microphones and speakers let the offices communicate with each other while the organisers announce gaming fixtures. Our scoreboard is in Sheets, which automatically updates its graphs with all the new information from every match. In the first year, we had 120 participants, and that number’s been going up every year since. We’ve even given out best-dressed awards for themes from Halloween to superheroes. Now, when I travel between our offices in different countries, staff walk up to tell me how good the LAN parties are for the company and morale. But there’s no question that combining our talents and pulling together through technology, wherever we are, lies at the heart of our global success. Editor's note: This week our Google for Education team will be joining thousands of educators at the annual ISTE conference. Follow along here and on Twitter for the latest news and updates. Teachers are great communicators, collaborators, creators and critical thinkers. It takes a teacher to empower students with these skills and create the leaders of our future. As technology becomes an increasingly integral component of our classrooms, the role of teachers becomes even more important. 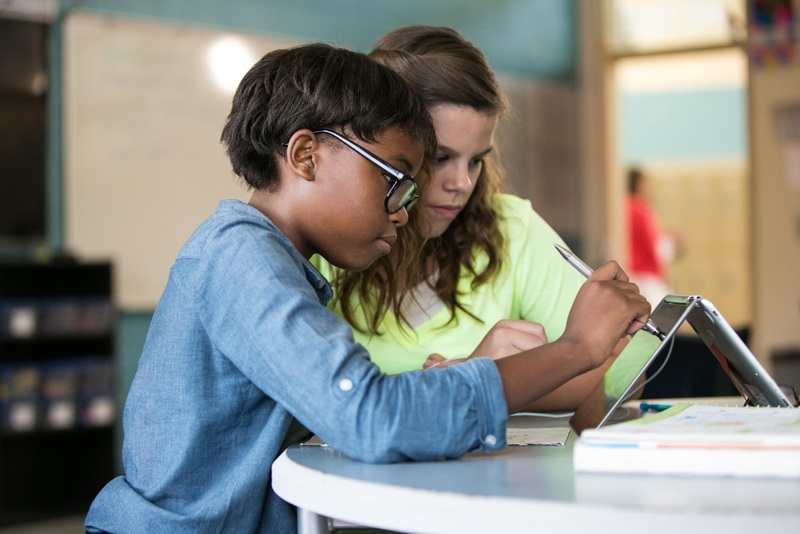 Today at ISTE, we’re announcing four more ways for these everyday heroes to engage their classes and empower their students using Google tools. Look out for a deeper dive on each of these launches on the blog throughout this week. 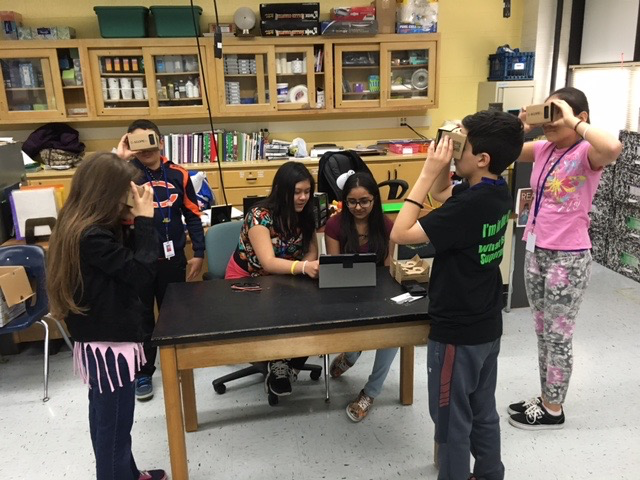 Since we launched the beta Expeditions Pioneer Program in September of 2015, more than one million students across 11 countries have taken one of our virtual reality trips. Today, we’re making Expeditions available to everyone. To get started, all teachers need to do is download the Expeditions app onto a set of devices. With more than 200 Expeditions to choose from, students can journey far and wide, learning from immersive new experiences. Our content offering has also grown and now includes Expeditions made by established educational content providers including Houghton Mifflin Harcourt. Pearson is beginning work on Expeditions content as well. The app is available today for Android and will be available for iPhones and iPads soon. 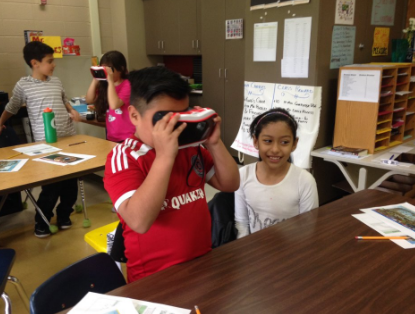 While Expeditions can be used with many of the devices schools or students already have — either smartphones with Google Cardboard or tablets in 2D full screen mode — Best Buy Education will also be making Expeditions kits available for schools to purchase. These kits will contain everything teachers need to bring their classes on amazing Expeditions: a tablet, virtual reality viewers and a router to connect them all. Kits are available for pre-order and will ship in time for back-to-school. We’ll also publish clear specs for partners interested in working with us to create their own kits. Collaboration is key to student success, but in most classrooms today the biggest screen in the room is out of reach for students. 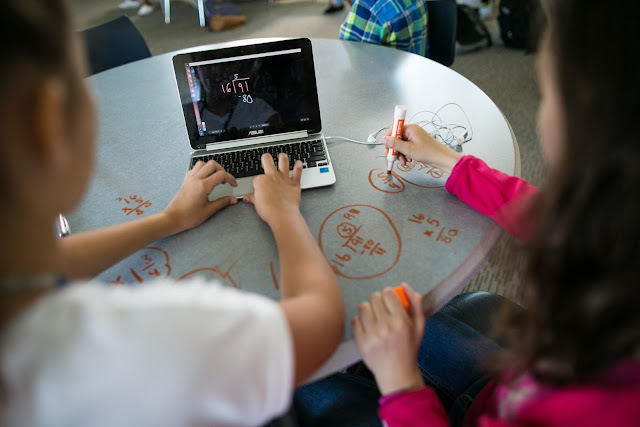 If students want to share their screens with the class, they have to physically connect their devices to the classroom projector. When teachers present, they’re tied to the projector at the front of the room. Educators are eager to overcome this barrier, so much so that wireless screen sharing for schools was one of the top features requested by teachers in 2015. Today we’re announcing Google Cast for Education, a free Chrome app that allows students and teachers to share their screens wirelessly from everywhere in the classroom. 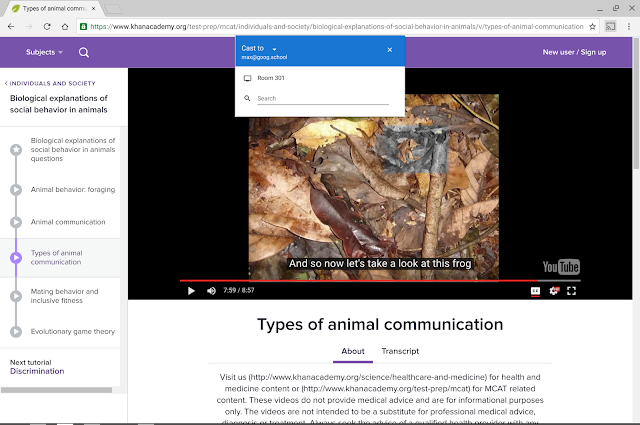 Cast for Education carries video and audio across complex school networks, has built-in controls for teachers and works with Google Classroom so it’s easy to invite your students. And because the app runs on the teacher’s existing computer, it doesn’t require new hardware. Teachers run the Cast for Education app, and students can share their screens with the existing Cast feature in Chrome. Check out the Cast for Education video. Getting feedback early helps students learn and teachers teach. Starting today, Quizzes in Google Forms will allow teachers to auto-grade multiple choice and checkbox questions — so teachers can spend less time grading and more time teaching. Teachers can also add review materials in the form of explanations, supplemental websites or review videos — so students can get quick, actionable feedback. Plus, teachers can get instant feedback on student progress, so they know which lessons need more explanation and what to teach next. We’ve also added a common request from educators to disallow students from sending themselves a copy of their responses. We’re on a mission to discover Chromebook tools that foster skills of the future, including problem-solving, digital literacy, leadership and creativity. We listened to teachers in Chromebook classrooms and collaborated with EdTechTeacher, and we’re excited to announce a collection of creative apps on Chromebooks that schools can purchase as a bundle. Explain Everything, Soundtrap and WeVideo are creative apps that help students demonstrate their understanding of curriculum through their own unique voice. We’ve worked closely with our partners to offer these apps to schools at a special price when all three apps are purchased together. They may be purchased alongside Chromebooks or on their own, and they’re available as an annual subscription per license from Chromebook resellers in the US. Contact your school’s reseller to learn more. Look out for a deeper dive on each of these product updates on the blog throughout this week. If you’re at ISTE in Denver, visit us at booth #2511 in the expo hall to demo these tools. And check out our sessions — taking place in room #103 — where educators and Googlers will be giving short presentations throughout the conference. Editor's note: Teachers are uniquely inspiring people. It takes a teacher to engage students, bring the classroom alive and turn classroom concepts into lifelong passions. We’re thrilled to celebrate everyday heroes like Matt from High Tech High, whose story is below, at ISTE this year in Denver. If you’ll be at the conference, stop by booth #2511 in the expo hall to demo the latest Google for Education tools. We’ll also be sharing over 50 presentations from educators and Googlers in room #103. San Diego’s High Tech High encourages its teachers and students to think outside the box. Instead of traditional curricula, the school emphasizes experiential projects and student-teacher equality, like using teachers’ first names in the classroom. These are some of the many reasons why Matt Martin has been teaching chemistry there for 4 years. In keeping with High Tech High’s interdisciplinary approach to learning, Matt’s students aren’t just amateur chemists — they’re entrepreneurs-in-the-making who use knowledge from all of their classes to take on classroom challenges. Matt wants his students to learn about the real-world applications of chemistry, not just the contents of their textbooks. 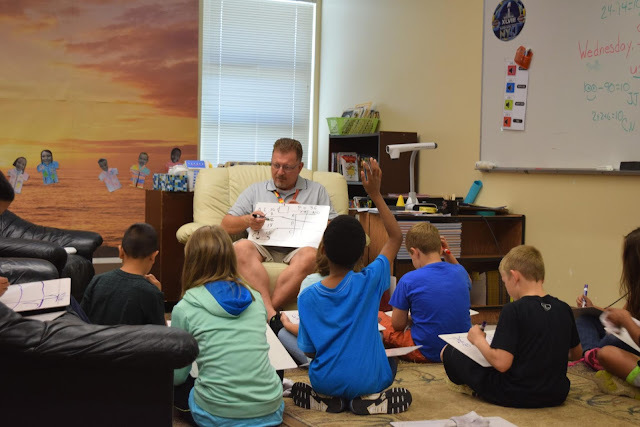 Matt and his students work together on projects, like the Mad Scientist program, which gives students the opportunity to design their own experiments. When one student had the idea of making soap with sodium hydroxide, otherwise known as lye, Matt saw the potential to turn a one-time experiment into a full-fledged business. All the students needed was a name. They came up with the Wicked Soap Company, an e-commerce business dedicated to handcrafted soaps. With help from some real-world scholars, John Cahalin and Elyse Burden, Wicked Soap Company has grown into a self-sustaining enterprise. 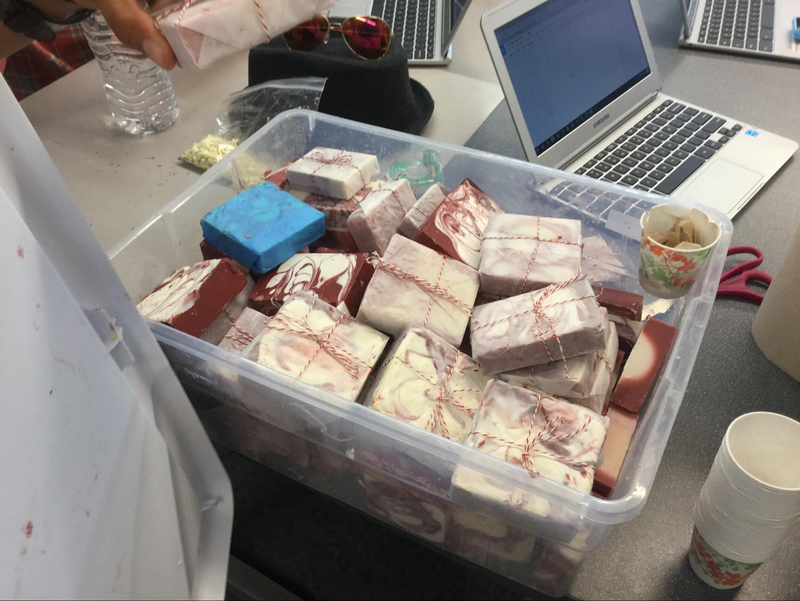 While initially only 20 percent of the soap students produced was usable, the class has boosted the number to 80 percent over time. Students were so eager to get involved with Wicked Soap Company that Matt decided to extend the project over multiple semesters. Matt’s 50 chemistry students — and dozens more supporting the company — rely on technology like Chromebooks and Google Apps for Education that let everyone participate and learn together. As technology becomes increasingly vital to education, the guidance and instruction teachers like Matt provide has never been more important. Many of Matt’s students have also discovered the intersection of their skills and interests. 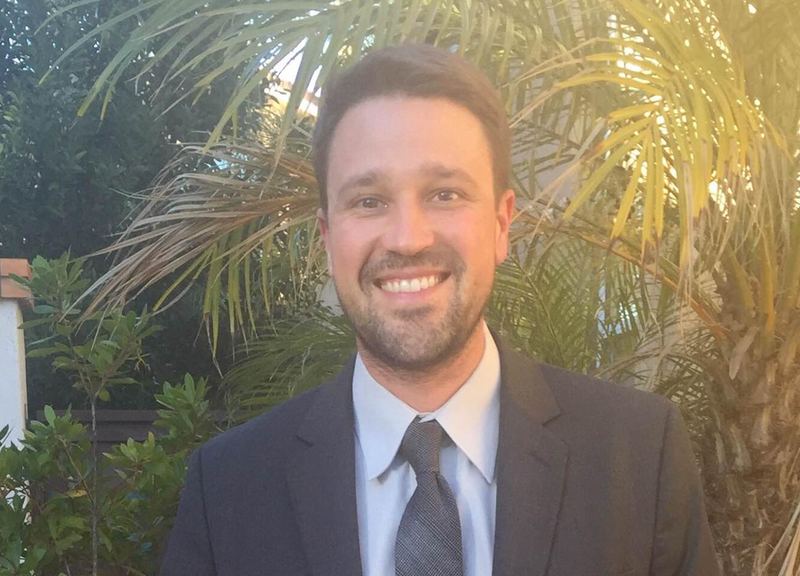 By merging students’ various interests — whether it’s in math or English — Matt created a classroom experience like no other. “I’ve learned so much more than just science, or making soap,” said another tenth-grader, “I’ve also learned about the dynamics of entrepreneurship. There was nothing more satisfying than watching people buy and admire something that I made.” Students haven’t just earned experiences, though — they’ve earned profits. 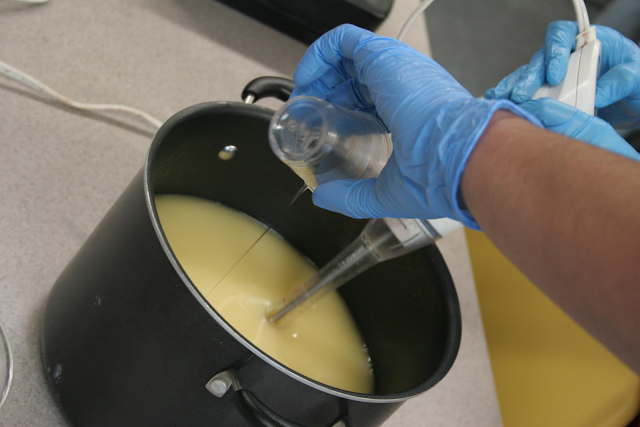 With Matt’s guidance, students have enthusiastically used Wicked Soap’s profits to give back to their community. They’ve donated over 1,000 bars to local homeless shelters. Students also purchased a motorized wheelchair for a senior student who would attend UC Irvine in the fall. When a community member’s house burned down, students donated all of their income the next day in support. It hasn’t been all work and no play for Wicked Soap’s staff, though. Students have gone on outings they wouldn’t have been able to attend otherwise, like a trip to see the Padres take on the Rockies. Wicked Soap Company, the fruit of Matt’s Mad Scientist program, shows how it takes a teacher to create engaged, successful students. As a chemistry teacher, Matt didn’t just teach how to make solutions and compounds — he showed his students how to discover their passions. If you’ll be at ISTE in Denver, come visit our Booth #2511 in the Expo Hall and our Session Room #103 to hear more stories like this one. Editor's note: Today we hear from, Adam Garrett, president of Dallas-based Fifth Manhattan. Learn how Fifth Manhattan switched to Chromeboxes for a simpler, more affordable desktop computer solution. When I joined Fifth Manhattan as president in 2014, I wanted to expand our customer base. We provide credit card payment processing services for small to medium-sized businesses and help them cut costs, increase revenue and provide a higher level of customer service. Big nationwide retail chains have substantial marketing budgets, but your local Italian restaurant and auto body shop don’t. That’s where we come in. One of my first orders of business was to upgrade our aging fleet of desktop computers. The team needed simple, easy to use computers with web access, so we decided to buy one Chromebox and try it out. We were astonished by how simple it was to set up and deploy. After the pilot, we bought Chromeboxes with Chrome device management licenses for each of our 30 employees. Since then, we’ve given a Chromebox to each new hire. Because of Chrome, we no longer need a traditional IT help desk. Fifth Manhattan has six full-time IT staff members, but they focus on building and managing our internal CRM platform. Before Chrome, they spent hours every week troubleshooting computer crashes. Today, they spend less time managing Chrome and deploying new devices and more time on their core responsibilities. Since we switched to Chromeboxes, we’ve only had one issue with a device — and it was a hardware malfunction, no fault of Chrome. As a payment processing company, we deal with highly sensitive data like bank account information and social security numbers, so security is critical. We’re required to maintain compliance with PCI regulations governing customer data. As part of this, we limit the number of employees who have access to sensitive internal data and monitor all usage carefully to avoid breaches. Chrome makes this easier to do. Administrators can set up different “organizations,” or teams so they can create customized settings for each team to limit which applications they can access. For example, our telesales team only need to use our web-based CRM tool, so we limit their usage to that, while account managers need access to their Chrome web browser and applications like Gmail and an e-signature solution. In addition, we can turn off incognito mode and disable saving to external flash drives. These settings help us control employee access so we can prevent data breaches and leaks. Fifth Manhattan employees are now able to work remotely, thanks to Chromebooks and Google Apps. We have five extra managed Chromebooks for employees to use if they’re unable to come into the office because of travel, parental leave or bad weather. As president, I travel often for customer meetings. My Chromebook lasts for more than eight hours, which comes in handy during cross-country flights and long meetings. I can even access my desktop applications remotely from my Chromebook using Chrome remote desktop. When I joined Fifth Manhattan, I wanted to grow our payment processing business into a thriving enterprise. Google Chrome has helped me scale the business from 35 employees to 100 in two years and makes it easier for everyone to focus on their work, not IT. Editor's note: Today’s guest author is Daniel Bray, Program Manager, eLearning, for the Australian Capital Territory (ACT) Education Directorate. 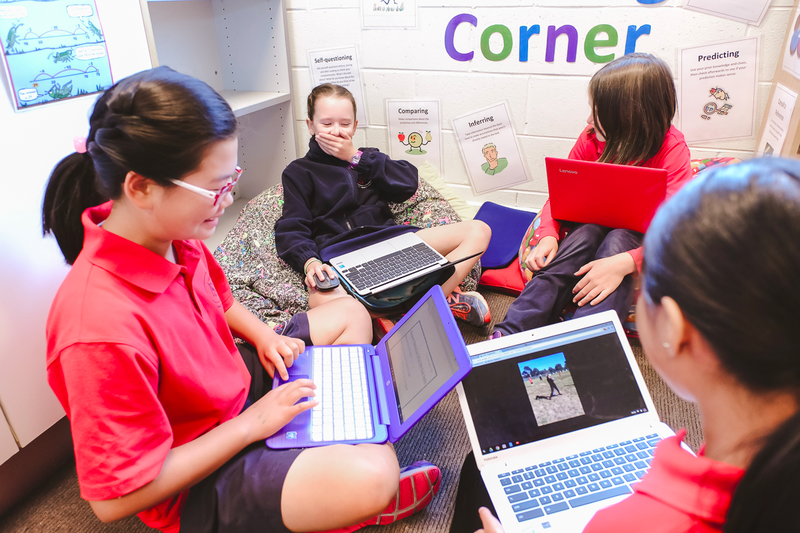 A former teacher, Bray initiated a districtwide digital program, which brought Chromebooks and Google Apps for Education into all Canberra public schools. The “Learn, Anywhere” program has since been recognised at the federal government level as a finalist for the national eGovernment Excellence awards for Project and Program Management. You can read full the full ACT case study here. Chromebooks were affordable and intuitive; Google Apps would let students work from anywhere, on any device; and Google Classroom would let teachers share assignments, track student progress and grade papers — all without printing a single piece of paper. In 2014, we ran a pilot test with 208 Chromebooks and Google Apps in four primary and secondary schools. During the pilot, the students using Chromebooks and Google Apps experienced super quick logon times and went from 2GB of network storage to enjoying unlimited Google Drive storage. As a Directorate, we couldn’t have been happier with the results: the pilot was a huge success for students, parents and teachers. Most importantly, Google was the choice selected by the schools. Not me. Not the CIO. The schools. Editor's note: Today’s guest blogger is Curtis Howell, Redfin senior product manager for customer engagement. 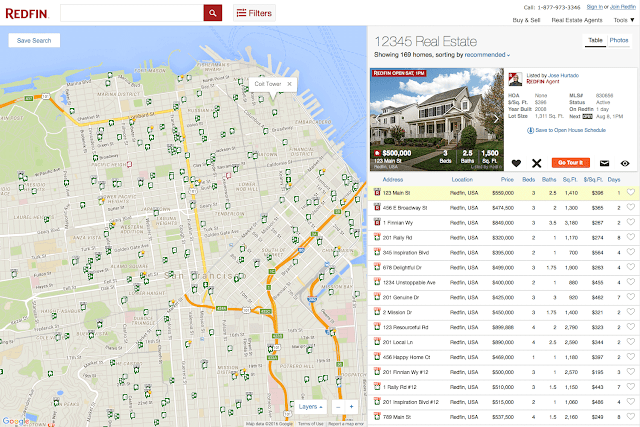 Read how Redfin makes it easier for buyers to find their ideal homes. Redfin launched in 2006 with the mission to change the way people buy and sell homes. Unlike traditional real estate brokerages, Redfin real estate agents are paid based on customer satisfaction, not just commission, so the agent’s and client’s interests are aligned. Redfin uses technology to improve the customer experience at every step, from the initial home search to the closing table. People often want to search for houses based on places-of-interest, such as a park or a landmark, and the Google Places API allows them to do just that. They can also find houses for sale in specific neighborhoods by drawing a polygon on a map and then searching within that area. Finding houses for sale on a map is only the beginning of the homebuying process. The next step is touring homes in-person with a Redfin agent. Our customers often schedule multiple tours in one day, so Redfin uses the Google Maps Distance Matrix API to estimate the time it takes to drive between homes. Google’s location-based search increased the rate of completed searches performed on our site by 4 percent. Data shows that faster searches leads to more satisfied and loyal website users, which ultimately leads to more clients for Redfin. Map-based search is one aspect of our technology that makes our agents more efficient and able to deliver great service to Redfin customers. Because Redfin is more efficient than traditional brokerages, we’re able to provide full service and still save our customers money. While university students are on their summer holidays, internships or jobs, their professors are already hard at work planning for fall courses. These course maps will be at the center of student learning, research and academic growth. Google was founded on the basis of the work that Larry and Sergey did as computer science students at Stanford, and we understand the critical role that teachers play in fostering and inspiring the innovation we see today and will see in the years to come. That’s why we’re excited to offer Google Cloud Platform Education Grants for computer science. Starting today, university faculty in the United States who teach courses in computer science or related subjects can apply for free credits for their students to use across the full suite of Google Cloud Platform tools, like App Engine and the Cloud Machine Learning platform. These credits can be used any time during the 2016-17 academic year and give students access to the same tools and infrastructure used by Google engineers. Students like Duke University undergrad Brittany Wenger are already taking advantage of cloud computing. After watching several women in her family suffer from breast cancer, Brittany used her knowledge of artificial intelligence to create Cloud4Cancer, an artificial neural network built on top of Google App Engine. By analyzing uploaded scans of benign and malignant breast cancer tumors, Cloud4Cancer has learned to distinguish between healthy and unhealthy tissue. It’s providing health care professionals with a powerful diagnostic tool in the fight against cancer. Google Cloud Platform offers a range of tools and services that are unique among cloud providers. The tool that Brittany used — Google App Engine — lets you simply build and run an application without having to configure custom infrastructure. Our Machine Learning platform allows you to build models for any type of data, at any size, and TensorFlow provides access to an open-source public software library (tinker with that extensive data here). Students will also be able to get their hands on one of Cloud Platform’s most popular new innovations: the Cloud Vision API, which allows you to incorporate Google’s state-of-the-art image recognition capabilities into the most basic web or mobile app. We look forward to seeing the creative ways that computer science students will use their Google Cloud Platform Education Grants, and will share stories along the way on this blog. Computer science faculty in the United States can apply here for Education Grants. Students and others interested in Cloud Platform for Higher Education, should complete this form to register and stay up to date with the latest from Cloud Platform. For more information on Cloud Platform and its uses for higher education, visit our Google Cloud Platform for Higher Education site. Today Jac de Haan, Developer Marketing for Google Maps for Work, speaks with Anna Hill, Chief Marketing Officer of The Walt Disney Company, UK & Ireland, and Spitfire Studio Client Services Director Tim George. They give us insight into how Disney and Spitfire Studio used Google Maps APIs and Google Street View. The immersive experience brings together more than 1,000 Winnie-the-Pooh assets, including videos, images, stories, downloadable content and games while also providing helpful guides, hints and tips for new mums. Fans navigate the 3-dimensional site and explore different character locations, including Pooh’s house, all through 360° photospheres. Jac de Haan: Anna, the first question’s for you. 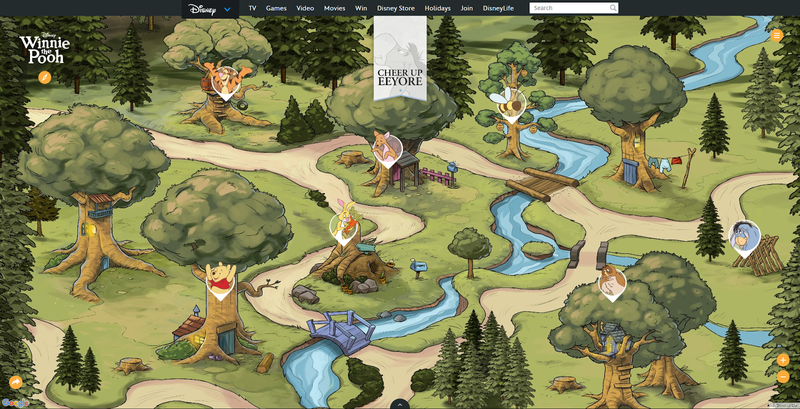 The new Hundred Acre Wood site is both modern in its immersive and interactive nature and historic, paying homage to Hundred Acre Wood, the home of Winnie-the-Pooh that we all know and love. What was Disney’s goal in building the website, and why did Disney choose Google Maps for it? Anna Hill: 2016 marks 90 years since families were introduced to the characters from the Hundred Acre Wood, when A.A. Milne’s first story was published. Winnie-the-Pooh and friends have stood the test of time with their heart-warming stories that continue to inspire children and adults alike. Disney wanted to create the world of Winnie-the-Pooh for parents and children to easily interact with the classic characters and inspire their play time. Google was the perfect partner for delivering the platform—research shows that mothers are very actively searching the Internet for advice, tools and new content. So, we partnered with Spitfire Studio to design and develop the site, which we wanted to be optimised for tablets as well as traditional desktop computers. We anticipated that the site would continue to evolve, so it was intentionally designed to make adding new map locations and content within existing areas over time incredibly easy and seamless. We want to continue building on the experience as we see how children and parents engage with the site and content. Jac de Haan: Tim, tell us about how you used Google Maps APIs to develop the site. Places on the map like Pooh’s House and Eeyore’s field are marked with customized pins. Click on a character, and the Google Maps Street View Service launches you into a Street View of that location — you can find yourself right inside Pooh’s House or out in Eeyore’s field. You can pan and look around, just like you can in Street View. We did this using our own creative assets. 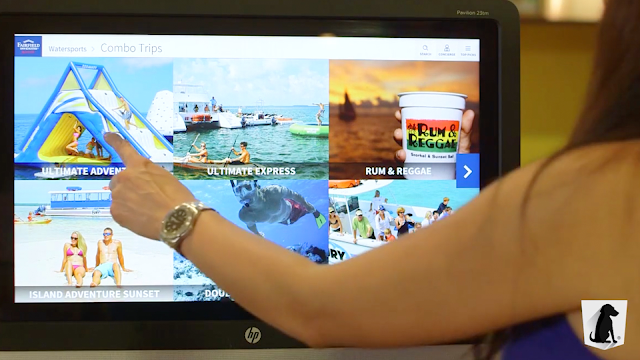 Once you’re there, you can click objects and access games, advice, videos and more. Jac de Haan: Anna, how does this Google Maps API integration empower your developers and benefit Winnie the Pooh fans? Anna Hill: Google Maps APIs are great to have in your creative toolkit, and they let you think and work in unexpected ways. Integrating Google Maps by detecting the locations of website visitors lets us create a more well-rounded experience for both parents and children. In partnership with Spitfire, we’ve created something we’re immensely proud of, and Google Maps play a big part in that. We look forward to seeing how families interact with the Hundred Acre Wood experience and hope that they have a lot of fun engaging with our characters — just as they have for the last 90 years, but now in a thoroughly modern way. 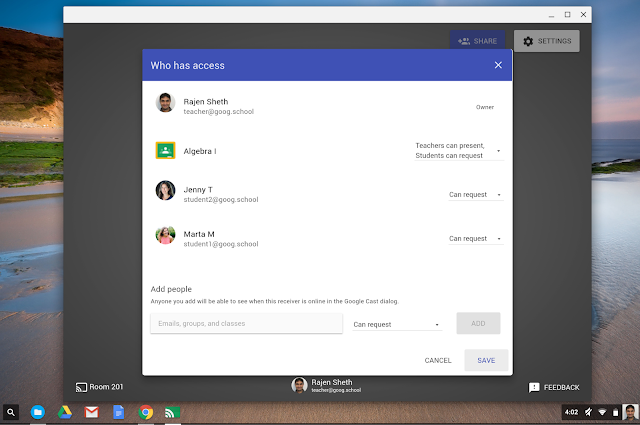 Editor's note: Small schools are seeing great success with Google for Education tools. 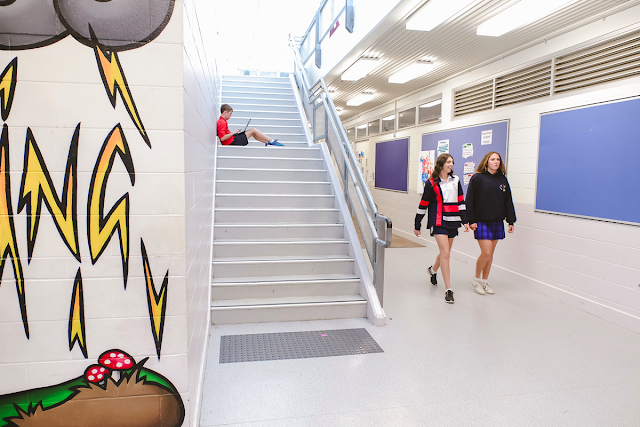 We spoke with educators and administrators from smaller districts across the United States to better understand how technology has helped them innovate, create more efficient processes, and make a positive impact on their students. This is the second in a series of posts where we explore the impact small schools are making on their students. To learn more about using Google for Education tools in charter schools, visit us here. Charter schools are small but mighty. While they don’t have the resources and support an entire district has, they do have ambitious goals when it comes to educating their students. We’ve encountered a number of charter schools who are leading the way in their use of technology to help students become inquisitive learners, fostering in them a desire to learn about the world around them. These charter schools are using interactive experiences to spark students’ imaginations, encouraging them to learn about international landmarks, social issues in their communities and historical events that have shaped our country. They’ve found that when students acknowledge diversity in their communities and the world, they’re encouraged to think about how they can create positive change beyond the classroom. Teachers at Brooklyn Prospect Charter School use technology to host discussions about current events, giving every student a voice — including those who are quieter in a traditional classroom setting. For example, after one teacher shared an article with her class about conflict in the Middle East via Google Classroom, every student had the opportunity to comment and share his or her opinion via a text-based discussion in Classroom. 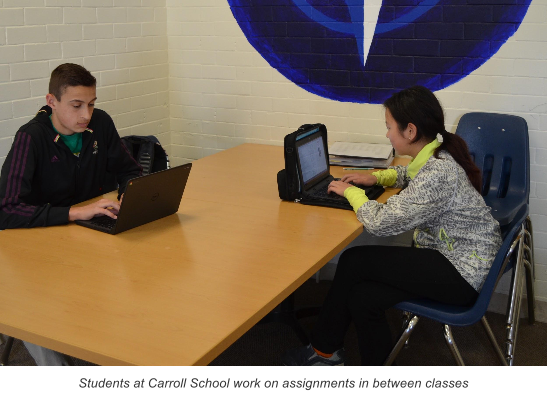 “When we discussed poetry using Google Classroom, I gained a sense of others’ perspectives. 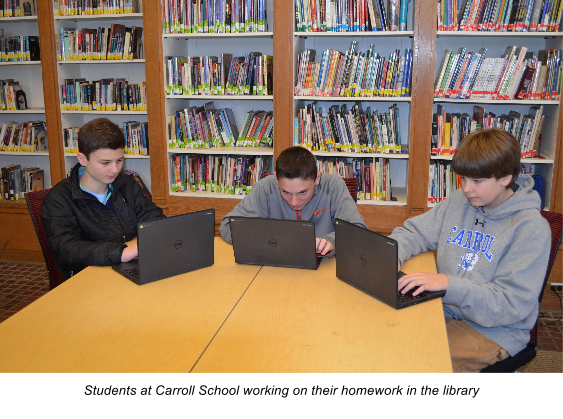 Google Classroom made it really collaborative and easy to share knowledge on the topic,” says fellow 11th grader Nicolas Villarosa. Along with having open conversations about international news, students at Brooklyn Prospect are encouraged to learn about the issues affecting their own communities. One 10th grader wanted to understand what his peers viewed as the most concerning global issues. As his end-of-the-year project for the international baccalaureate program, he created a survey in Google Forms to collect his peers’ opinions on the topic. He then used those responses as inspiration to compose a musical protest album to raise awareness for the gravity of the issues. 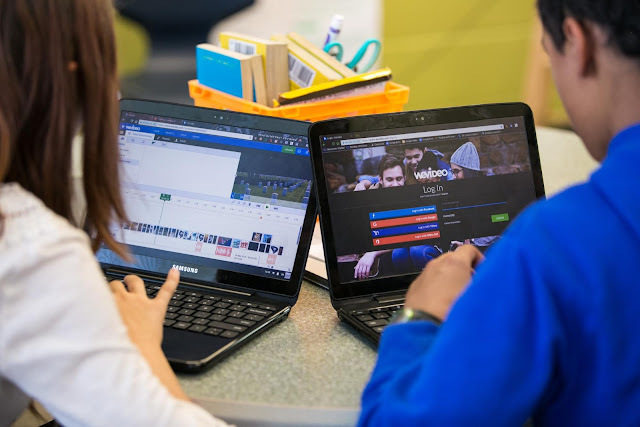 “Technology is helping our students become citizens of the world by cultivating their awareness and giving them a global view,” says Tyra Frederick, educational technology coordinator and high school English teacher at Brooklyn Prospect. Exposing students to a global curriculum at a young age is vital for them to become well-rounded, culturally aware citizens. In addition to teaching geography and history, many schools teach classes about international current events. They also explore how historical events have shaped a city’s identity. Westlake Charter Schools, for example, encourages students to become curious learners about their pasts. 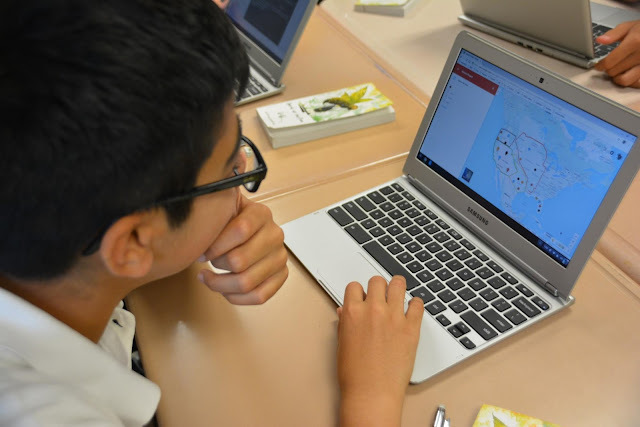 When eighth grade history teacher, Caroline Gaea, gave students an assignment to map the Manifest Destiny across the United States by dropping pins in Google Maps, students went above and beyond. They engaged in critical thinking, not only commenting on the significance of a location at a particular moment in time, but also noting the overall importance of that moment in the broader context of American history. Even after that assignment was complete, students took the initiative to dive deeper into the topic — they impressed their teacher with a historical map of the United States, using layers in Google Maps to show the 1803 Louisiana Purchase. 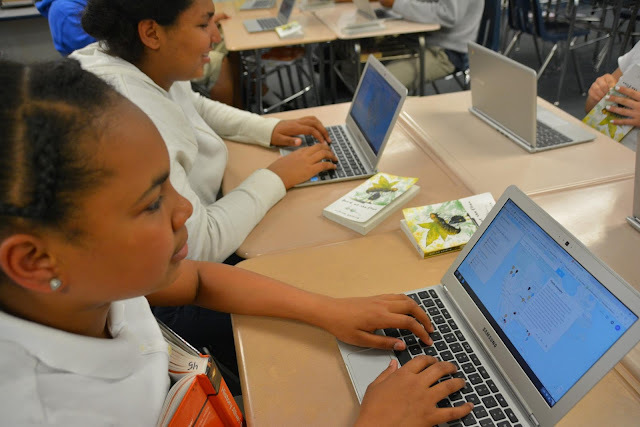 “This project made me even more excited to learn about American history because the Google tools give us an opportunity to express our knowledge on a whole new level,” says Grace, an eighth grader at Westlake Charter Schools. “Mapping out the places and presidents of that time period made it feel like we were there because we understood it better,” says Jada, an eighth grader at Westlake Charter Schools. Students at Challenge to Excellence Charter School are using technology to travel outside of the classroom. 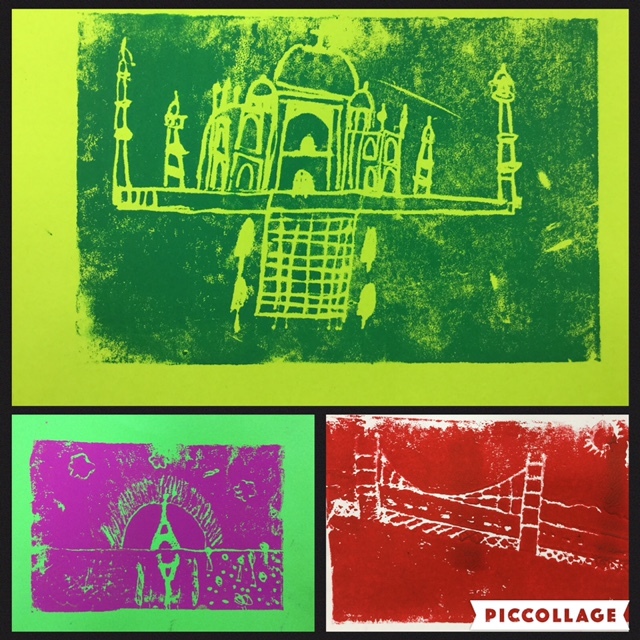 When a second grade student traveled to India for a family vacation, his classmates virtually went with him. The student took a tablet so he could take pictures of his trip and share them with the class. Back in the classroom, students researched the landmarks that their classmate was visiting and had a real-life view of places like the Taj Mahal using Google Earth. These are just a few of the ways charter schools are inspiring students to think big and learn about experiences beyond their own. What do you think? What are the best ways for schools — public, independent or charter — to approach a global education?